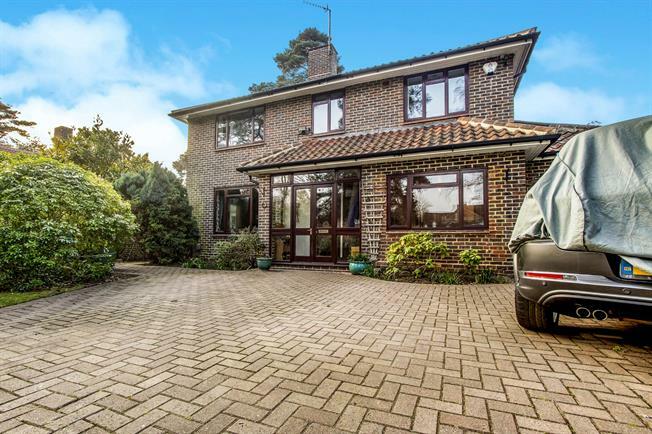 4 Bedroom Detached House For Sale in Woking for Guide Price £795,000. A detached four bedroom home having been extended/improved by the current owner, set away within a parkland environment. Built in the 1950s a traditionally built home conveniently positioned within a no through road, located on the outskirts of West Byfleet, convenient for both train station and local shops. Enjoying a private position and with a mature rear garden there is also parking for several vehicles and an attached garage. The kitchen has a range of eye/low level units with space for an American fridge freezer, granite work tops, breakfast bar and a tiled floor. With three receptions the flexible accommodation is ideal for family living including a separate laundry room with advantage of a stable door to the garden. In the 17ft x 12ft conservatory, the fully glazed raised apex roof line extenuates both the light and volume whilst giving direct access out onto the garden/patio via French doors. The garden extends in excess of 80ft and is mostly laid to lawn with a mix of mature plant/shrub borders and a scattering of trees, offering a mature diversity with high degree of privacy. With other neighbouring homes built at the same time, there is a sense of uniformity and space, including a communal green (managed by the local council). West Byfleet town centre is within a mile where the mainline train station offers direct line services into London Waterloo (circa 30-35 minutes). West Byfleet also benefits from a Waitrose supermarket, selection of shops, a bank, restaurants and licensed premises. Woking town centre being within two miles (accessible via the Woodham Lane) has the Peacocks shopping complex, incorporating retail outlets, restaurants, theatre and a cinema. Viewings are highly recommended by Gascoigne Pees via appointment, the vendor's sole agent.